I have to admit to doing some of my own censorship. I didn't have a problem with the book being in my children's school library. I didn't have a problem with other children checking it out (I was a parent volunteer). I did have a problem with my children checking it out. The book? Gads, it was so long ago....part of a series....The Stupids something something....I never read it, my problem was solely with the name the author choose for the family. Okay, with that said. Banned Books Week is coming up at the end of September. Read a banned book. Better yet, check it out of the library and turn your nose up at those who want to tell us what we can and can't read. I haven't read any books from the lists this year but do have Hunger Games on my list of books to read soon. It's fun to read why the book was challenged. Twilight for violence? Hello, it has vampires in it! I sound like a broken record. My views on banning books has been posted before. I refuse to not read something because you tell me not to. If the book doesn't sound good I'll decide on my own not to read it. If the book sounds great (hello Harry Potter!) then I'm going to read it. Now that my children are grown, I don't tell the what they should and shouldn't read. I guess I may change my mind if I saw a book about learning Satan worship or something in their room....but they're good kids, I'm not worried about their reading choices. I think we all censor to some extent, we just don't think of it that way. What books don't I buy my own child or for my school library, wether consciously or not. It's when we ban for others that the trouble starts. 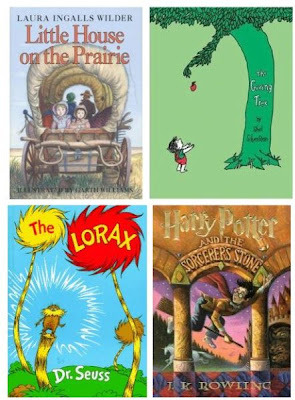 I love Banned Book Week at my school when we read excerpts from fantastic books that the students love that someone, somewhere has banned. I agree that as parnets we guide our kids to certain books, movies, foods, activities.....you understand. But to out and out say you can not read that. I not sure even as a parent I have that right. "...check it out of the library and turn your nose up at those who want to tell us what we can and can't read." Brava.